The Giants win 10 straight on route to the playoffs! Is what I want to be writing about the next few Giants games of the season. Unfortunately I don’t think that is realistic. I do think it’s not out of the question that the Giants win all of their next games except a loss to Green Bay if they play like they did last night against the Bears and stop throwing interceptions. Last night I saw the team that the Giants could be. They ran the ball the entire game instead of quitting on it and throwing like wild men for an entire game. The defense once again looked good enough to win the game as they got stops when they needed to. 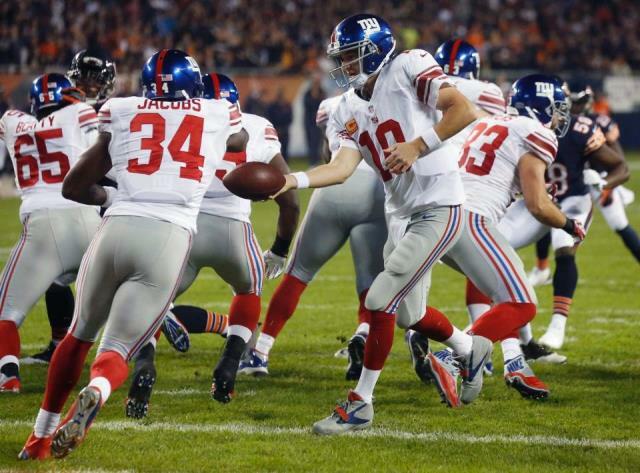 Unfortunately the Giants front four is non-existent and got no pressure the entire game. I mean what happened to the Justin Tuck who sacked Brady in the super bowl? What happened to the Pierre Paul that was so dominant a few seasons ago? My pet theory is that the Giants roster has too many players that are complacent from winning a super bowl or two and not enough players who are hungry for their first ring. The Giants just don’t seem to have the desire to win when their back isn’t against the wall and they’ve really put themselves against it now. This is given credence by the fact that Jacobs who left the Giants and football for a while and really hit rock bottom is the guy who played the hardest last night! I mean he really looked young again! Give him the rock even more because he wants a win and you can tell! It’s time they stop focusing on mistakes and just go out on the field and play football. The defense needs to punish the opposing offense and play with reckless abandon. I mean what do they have to lose? The offense needs to run it on first and second and convert with a short pass on third. They need to be just as physical and control the game at the line of scrimmage dictating the tempo of the game as they force their way down the field. I don’t know whether Eli Manning’s current passing problems are due to bad protection or his own issues this season but it’s clear he needs to be reeled in and the Giants need to throw less. 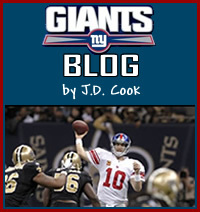 Return to the strategies of early developing Eli Manning until he can prove that he is ready for more of a pay load. If the Giants do that and return to their football roots. I think they can save their season or at least end up with a respectable record. The one thing I absolutely do not want to see happen is for them to loose nine games in a row because at that point their season is a wash and I’d almost consider not writing the Giants Blog anymore because of the pointless nature of it. I mean I’d still watch every game but what could I write about then? Well it’s a win for the Giants…on route to the off season. Well it’s a loss that doesn’t affect anything for them, etc. Just win Gmen and give me something to write about. I know this team can do it!